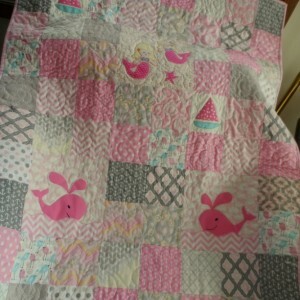 Nautical baby quilt. 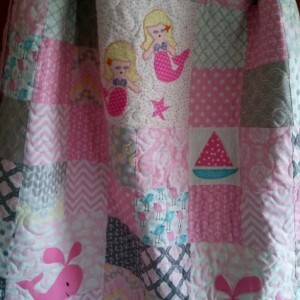 Handmade nautical blanket with anchors, mermaids and whales. Reverses to a grey, pink and white chevron print. Quilt country original design, one of a kind quilt. Make this piece a showcase in your nautical nursery, one that a baby can love. 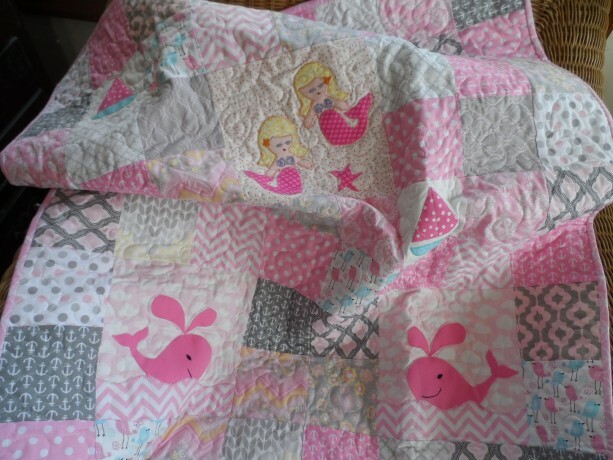 This modern quilt is sized for toddler or baby. 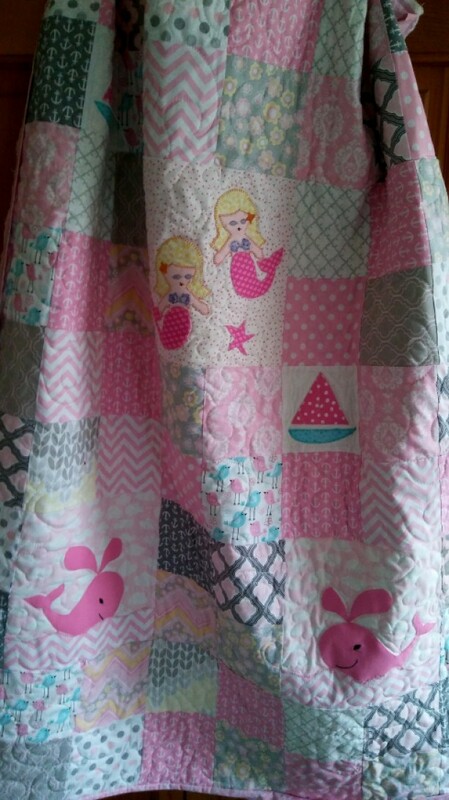 Size: 36" by 45" Colors: Pink and grey. fabrics: 100% cotton front and back. 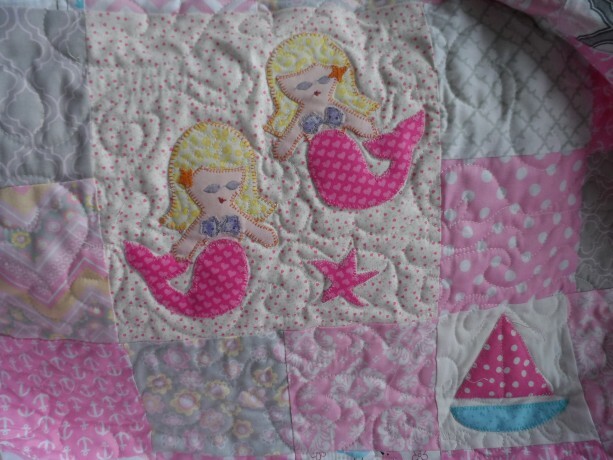 batting: Hobbs Heirloom Natural 100% cotton Handmade appliques: 2 mermaids block, 2 whale blocks and 2 small sailboat blocks Quilt is completed and ready to ship. Each quilt in my shop is handmade by me. I choose colors and fabrics as I sew to create a one of kind combination of fabrics and appliques. 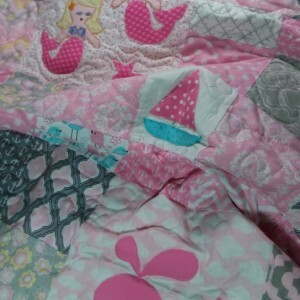 No two quilts are exactly alike, although I do often recreate color schemes and ideas. 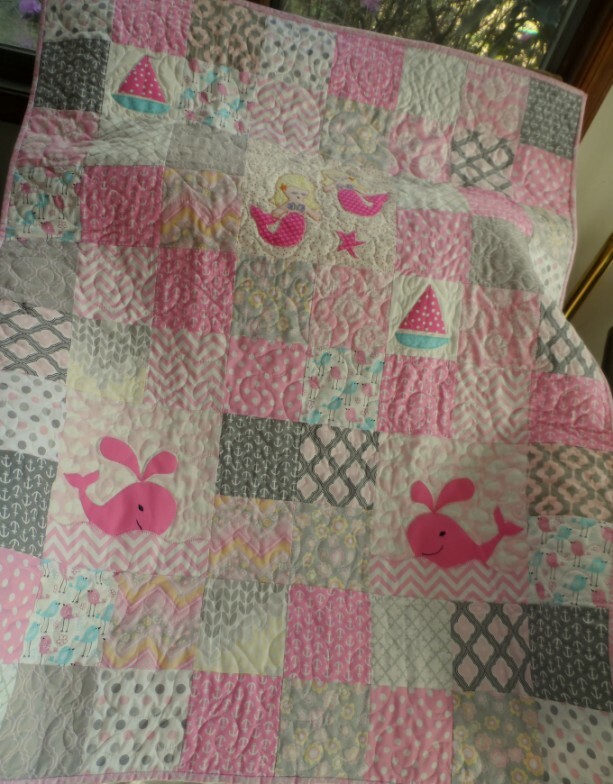 The quilt is backed with a grey, pink and white chevron print in soft cotton. 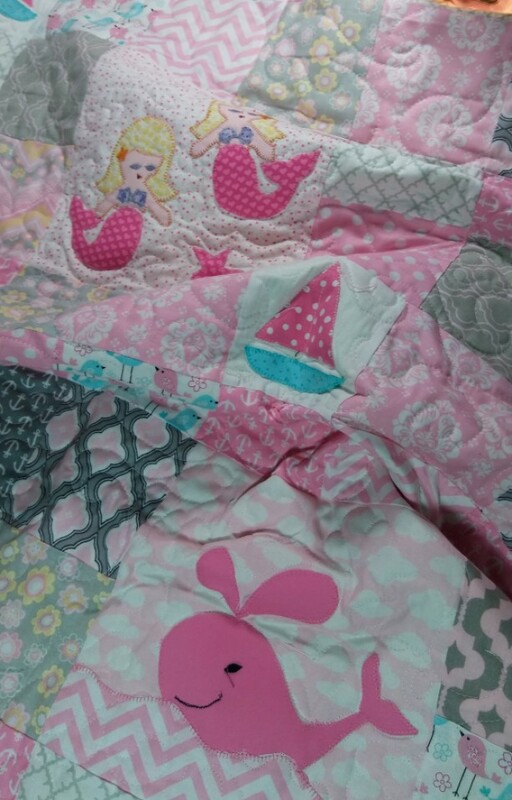 The binding (edge) of the quilt is professionally finished in the traditional quilters method. Quilt edges are bound with a double fold binding in coordinating fabric that is machine stitched to the front and hand stitched to the back. 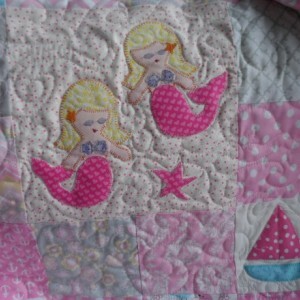 The appliques are fused with quilters webbing. 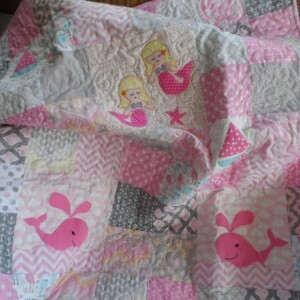 The edges are carefully sewn with a quilter's button hole stitch. I can create a coordinating pillow cover in the size of your choice. The Hobbs heirloom batting has a soft drape and antique finish. This cotton batting can shrink from 3% to 5% when washed, giving the quilt a soft cuddly feel. For best results, wash in cool water and machine dry in a cool dryer. Use a mild detergent. Do not hang in the bright sunlight as the cotton fabrics will fade. This quilt was designed and sewn in my cat free, smoke free home.